Let's cut to the chase on Greece. Wall Street is betting that there's about a 75% chance that Greece defaults on its debt. 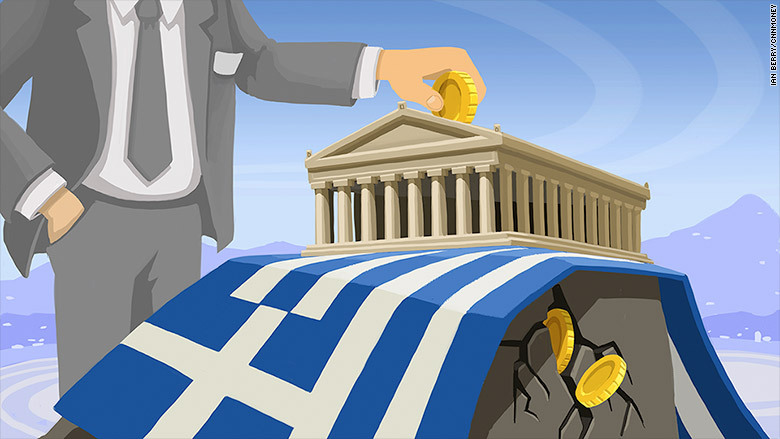 Athens is running out of time to cobble together enough bailout funds to avoid a possible default. The Greek government has just days to reach a deal before risking an exit from the eurozone that would likely be disastrous to its economy. "Default is looking more and more likely," Peter Boockvar, chief market analyst at The Lindsey Group, wrote in a note to clients on Tuesday. The chance that Greece secures a last-minute deal with its creditors is "looking slimmer now" and may be less than 50/50, said Jan Randolph, director of sovereign risk at IHS Global Insights. Greek creditors are "looking for a regime change in Athens with a government they can actually do business with," Randolph said, adding they've "given up on" Greek Prime Minister Alexis Tsipras. Related: Will indebted Greece turn to sanctioned Russia? Way, way riskier than Russia: The CDS market is clearly flashing warning signs about Greece. It now costs a whopping $3.6 million a year to insure $10 million of Greek bonds against the risk of default, according to FactSet. While that's down from the peak of the European debt crisis back in 2011, it's up nearly eight-fold from a year ago. To put that into context, it's currently 10 times more expensive to insure Greek debt against default than Russian debt. That means the markets believe Greece is way riskier. It costs $355,000 to insure $10 million of Russian bonds against default, according to FactSet. That's down 25% so far this year thanks to Russia's stabilizing economy and the fact oil prices have stopped plunging. 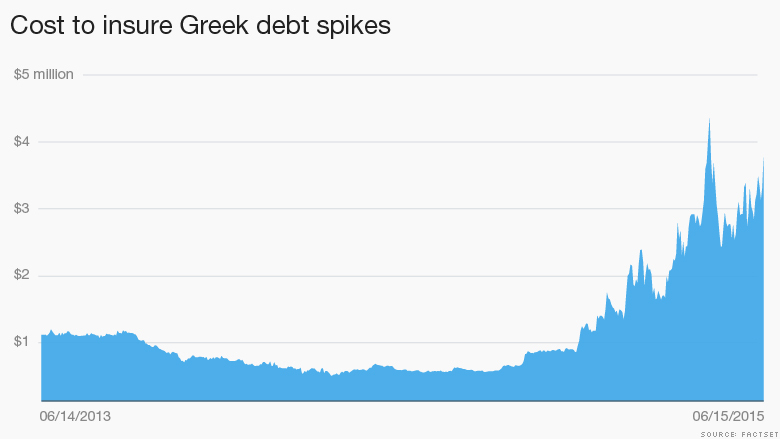 Five-year credit default swaps on Greek debt have soared amid the deepening divide with the country's creditors. Of course, the CDS market is just one measure of risk. It's also highly dependent on assumptions, especially about how much of their investment a creditor would recover if the country does default. Greek stocks, bonds plunge: Yet other, more liquid markets are also flashing warning signs about Greece. A Grexit is still a longshot: Even if Greece ultimately defaults, it doesn't necessarily mean it will exit the eurozone. "We have another two or three episodes until we get to a Grexit -- and that's unlikely," Randolph said. He pointed to recent polls indicating many people in Greece don't want to ditch the euro, a transition that would be extremely painful financially. A new currency would be valued significantly below the euro, crushing the value of assets Greek people own. "It is political suicide to try to introduce a new currency. No one wants to volunteer for a 60% pay cut or a 60% depreciation of their homes," said Randolph.